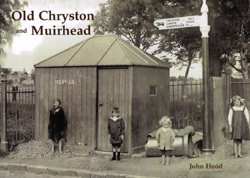 The cover picture, showing barefoot children next to the stretch of common land known as The Muir, recalls a time when childrens' play was less structured that it is today. Back then, bathing in the Bothlyn Burn and fishing there for 'baggie minnows' was something that local youngsters did without adult supervision. This collection of photographs contains many such scenes of life at a much slower pace then we have now become accustomed to. Clydesdale horses still worked at Holms Farm, Muirhead. At the weekend they would pull the carts taking children on their Sunday school outing. The local brass band would lead parades down Chryston Main Street closely followed by local folk of all ages. The success of William Drummond's Braeside Garage on the main Glasgow to Stirling road, pictured in 1930, was perhaps a signal of less peaceful times to come. Continuity is guaranteed however by the success of Chryston Bowing club, shown at its annual opening in 1904 and still flourishing into the 1990s.